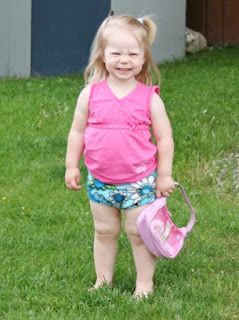 I have been cloth diapering since my first child was born 8 years ago. I love it, my husband loves it. We wouldn't have it any other way. 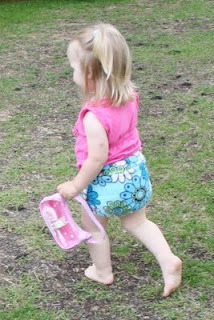 One of the things we like about cloth diapering is saving money. It is very easy to spend a lot of money on cloth diapers if you choose to. We do not. We have bought some, my favourite purchased and longest lasting ones have been the one size cloth diapers from Mother-Ease. While you can fit these on your infants, they look a little silly with a diaper up to their armpit! So, I do use smaller ones when they are teeny tiny. The one size cloth ones have great movement and fit so nicely. However, because I am frugal (sometimes) I have made some of my own diapers. I am close to having a pattern that I love, but I have not sewn enough diapers to fully work out the kinks. Diaper covers, that is where I was heading with this post. Fleece covers are AWESOME. They are so easy to use. They are not 100% waterproof, so it is best not to use them for long car rides or anywhere that might cause compression leaks, because the liquid will go through the fleece. Around the house or short trips in the car, we love our fleece. What the fleece does is eliminate the need for pants, and makes the diaper breathable, which makes your baby’s bum happier. All winter we have used fleece pants on our littlest one, cover and pants all in one. Perfect. Now that the weather is warming up and she is still not fully ready to potty train we needed something a little cooler, so I turned to Katrina's soaker patterns. I use her pattern to make the pants too. Perfect for under dresses or as shorty shorts!